Using the business skills she learned through Young Women in Enterprise, 24-year-old Cecilia Katungwa (left) launched a a shop selling knitted goods. TechnoServe recently received a new grant from the Nike Foundation to continue an initiative to economically and socially empower young women in Kenya through 2012. 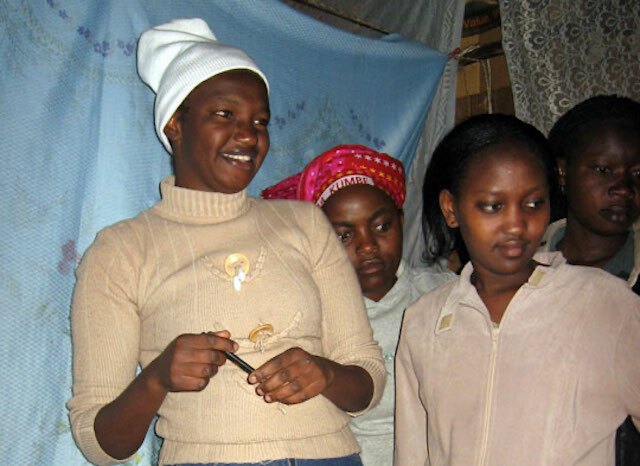 The Young Women in Enterprise (YWE) program helps more than 3,000 adolescent girls and young women, ages 15 to 22, in low-income areas of urban Kenya, so they can avoid problems such as HIV/AIDS and go on to create employment-generating, women-owned businesses that support Kenya’s communities. The YWE program comprises four components: training on using tools to plan, implement, and manage a small business; links to financing, with an emphasis on the importance of savings; mentorship guided by leading women entrepreneurs, among others; and mini-business plan competitions, which identify promising business ideas and enable talented entrepreneurs to further advance their businesses. The program, originally piloted in 2005, has already made a big difference in people’s lives. Joining a local YWE club was the impetus 24-year-old Cecilia Katungwa needed to stitch together her entrepreneurial vision of selling knitted goods. One of six siblings, Cecilia became responsible for her family’s welfare after her parents died. She managed to attain a secondary school education but lacked a steady income. Through YWE, she learned new business skills and used them, together with the $640 in seed capital she won in the YWE business plan competition, to launch a shop for her products. It currently employs two other young women. Cecilia believes that within 10 years she will be running a very successful business with many employees and locations. The business skills, support network and life skills – such as HIV/AIDS awareness and prevention – obtained through YWE create new economic opportunities for participants such as Cecilia, helping them avoid the vulnerability that too often leads girls to become child brides or at risk for HIV/AIDS.